It’s Day 12 and Joe has been worried about his injured finger. Peter tries to ingratiate himself into the tribe by using his knowledge as an ER Doctor to help Joe with his injury. He realizes that ever since Liz was voted out, he is at the bottom of the tribal hierarchy so he has to make himself seem useful to the tribe moving forward. Neal isn’t moved by Peter’s attempts. After all, it was Neal whom Peter lobbied to get voted out days before. Neal thinks that there may be a hidden immunity idol near their camp so he needs to go find it before Peter does. He looks for any tree that sticks out in the forest and he finds a brightly colored clue to the location of the idol hidden inside a tree. Just like the clues on the Brawns and Beauty tribes, it has directions for locating the key to the box that holds the actual idol. Neal doesn’t have nearly as difficult a time finding the key so he’s quickly able to secure the hidden immunity idol for himself. 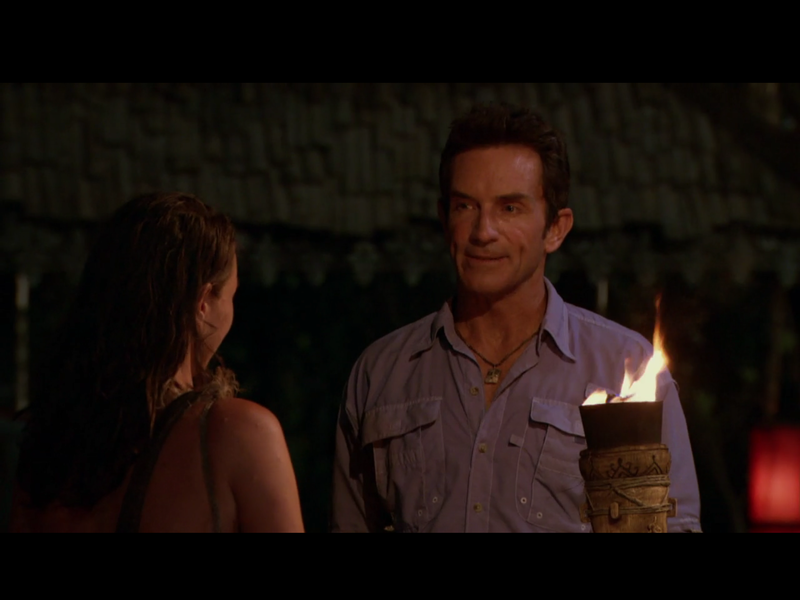 He says that his goal is to find another immunity idol or another person who has an immunity idol so that he can utilize the “Super Idol Twist.” With one idol in his possession, Neal thinks he is the frontrunner in the game thus far. The three tribes arrive on their mats where they wait for Probst to announce the challenge of the day. However, Probst tells the tribes to drop their buffs instead. The plan is for the tribes to split into two separate tribes of seven but because there are only thirteen castaways left in the game due to Caleb’s evacuation, one castaway will be on a tribe of his or her own for one vote. That person will be immune from the tribal council but will be forced to live on the Brawn tribe beach alone until they replace the person who is voted out of the game at the next tribal council. The tribes choose their new buffs at random and Julia from the Beauty tribe is the odd woman out. While she’s happy to survive another week in the game she says that living on her own beach will put her at a disadvantage. She doesn’t have a chance to get to know any of her potential tribemates. The new blue tribe is called Chan Loh. Chan Loh consists of Neal and Debbie from the Brains tribe, Cydney, and Jason from the Brawn tribe and Michelle and Nick from the Beauty tribe. The other tribe, Gondol, has Joe, Aubry, and Peter from the Brains tribe, Tai, and Anna from the Beauty tribe and Scot from the Brawn tribe. So while Julia is forced to go survive on her own, the Gondol and Chan Loh tribes head to their new camps for the second phase of the game. Michele tells us how devastated she is to see that she, Anna and Julia had each been sent to separate beaches, weakening their alliance. Contrary to Michele, Peter is elated at the opportunity to move to the Gondol tribe. He was the odd man out at the Brains tribe but now it’s in Aubry and Joe’s best interest to move forward with him, giving the three of them the majority of their new tribe. He’s confident that he is in a great position to make it to the merge. As the Gondol tribe gets to know each other, Scot knows that he is at the disadvantage of being the only former member of the Brawn tribe. Luckily for him, Peter is already planning on targeting either Tai or Anna. It makes sense because if Julia is given the opportunity to join the tribe and realign with Tai and Anna, the former Brains member will no longer be in the majority. Aubry echoes Neal’s sentiments from earlier in the episode that Peter cannot be trusted as the 3rd member of their alliance but she can see the logic behind what he’s saying about voting out either Anna or Tai. At Chan Loh beach, Michele has to make some moves to align herself with the majority of the tribe. Her main allies are on two separate beaches so she has some work to do to get herself into the majority. While the castaways are getting more familiar with each other, Debbie immediately looks for an opening to align with Cydney and Jason. Debbie and Cydney bond while collecting coconuts. Cydney thinks the two of them could be a strong duo and is drawn to the maternal vibe she gets from Debbie. The two women are both very smart and fit. They agree that ultimately they would like to see a woman win this season of Survivor. Debbie then approaches Jason and solidifies her four-way alliance to target Michele and Nick. Tai makes himself useful by falling into the provider role at Gondol. He and Scot become fast friends. Scot says that he has a “man crush” on Tai and it seems like Tai has moved on from his bromance with Caleb. While Tai proves his usefulness, Anna starts throwing Tai under the bus by telling the rest of the tribe that he has been searching for an immunity idol. Anna knows that either she or Tai will be targeted so she has to work quickly to survive the next tribal council. At Chan Loh, Nick takes a page from Debbie’s book and attempts to win over Jason and Cydney’s loyalty. Nick says that he is the smartest person remaining in the game with regards to manipulation. Jason notices that he and Cydney are planted in the middle of the two alliances of Brains and Beauty. With two pairs vying for their votes, the two former Brawns tribe members hold most of the power. Julia is all alone on what used to be the Brawn tribe beach. Dehydrated and paranoid at being stranded on an island all by herself, she’s having a difficult time. As the youngest contestant in the game, this particular aspect of the game is her hardest task yet and with every day she spends alone on the beach she gets more and more paranoid. The immunity challenge is relatively simple. The tribes have to swim into the ocean to retrieve fish-shaped puzzle pieces and bring them back to shore to complete the puzzle. Scot and Aubry swim out for the Gondol tribe against Jason and Nick for Chan Loh. Scot does the majority of the work for Aubry who is not physically comparable but the two of them take an early lead. Both tribes end up at the puzzle at about the same time but Neal and Debbie make quick work of the puzzle for Chan Loh beating Anna and Peter and winning immunity for their tribe. With Gondol losing the challenge, Julia will be replacing one of them in the tribe after tribal council. Tai recognizes that he could be in danger of being voted out of the tribe but he still has his hidden immunity idol that nobody else knows about. Aubry approaches Pete and Joe and pitches the idea of targeting Tai, but the two men would rather vote out Anna. Peter recognizes that Anna’s beauty and intelligence could make her a much bigger threat than Tai. Tai’s role as provider makes him more of an asset than a threat so Aubry agrees that Anna should be the one to go. Even though Peter is lobbying to save Tai for one more round, Tai does not like him. Tai knows that with his immunity idol he has the opportunity to turn the votes against Peter so he shows it to Anna and Scot. This is great for Scot who now knows about Tai’s idol as well as Jason’s. The idols have the ability to be played in conjunction with each other to form a super idol that can be played after the votes are read. If he can make it to the point when the tribes merge he might be able to use that knowledge to his benefit. Scot convinces Tai that the tribe is voting to eliminate Anna but now Tai has a difficult decision to make. He could use the immunity idol to save Anna. This move would not only eliminate a member of the former Brains tribe, but it would also secure the majority for the former Beauty tribe members when Julia returns to the game. His other option is to hold onto the idol for himself to save for later in the game. At Gondol’s first tribal council Probst opens up the discussion about tribal alliances. Aubry says that the tribal alliances will still exist for a while because it’s better to vote with the people they already know rather than trying to find trust in new alliances. That puts Scot in the hot seat because he’s the only person on the tribe without any pre-existing tribal alliances. Anna and Tai both acknowledge that they are the most obvious candidates to be voted out because Scot could be a huge asset in challenges to come so each of them makes their case for why they should stay. When asked about hidden immunity idols, Joe says that he doesn’t believe there are idols in the game. Peter isn’t concerned about Anna or Tai making any moves. He thinks it’s highly unlikely that Scot, Tai, and Anna would team up to vote out a member of the Brains alliance but Aubry believes that anything could happen. Probst gives the castaways one chance to use a hidden immunity idol but Tai doesn’t move. Anna’s last hope disappears as the votes are read. She voted for Peter but everyone else in the tribe voted for her making Anna the next casualty of Survivor Kaoh Rong.